The Fisher Scientific FS20H Ultrasonic Cleaner with timer is powerful enough to remove heavy oils, buffing compounds, proteins, consistent enough to manage difficult laboratory cleaning, and safe enough for delicate components or fine jewelry. Ultrasonic sound waves move through a cleaning solution, creating an effect called cavitation, which is the rapid formation and collapse of microscopic bubbles. 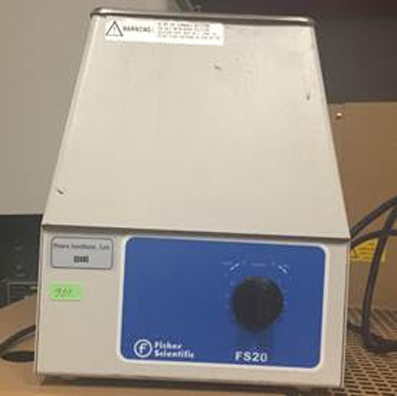 Thank you for your interest in the Fisher Scientific FS20 Ultrasonic Cleaner (ID #: 19076). To speak with a representative, please fill out the contact form below or call us directly.